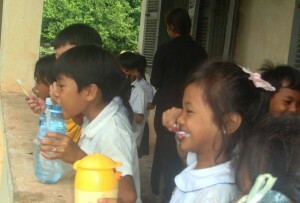 Smile 4 Cambodia is our toothbrushing program. Toothbrushing education and daily toothbrushing during school hours. So far 7 schools are included and we have a total of 3100 students taking part in the project brushing their teeth daily. For this program B4C installed a sink and water system at the participating schools.